Nice chart. It really does show where the cuts must be made if we are ever to trim the debt. What we are seeing with the Unions today, is what will be taking place in years to come if we don't start making some cuts today. States are trying to make cuts but we see Unions bitching and moaning about even small cuts in their benefits. I expect it will get much worse as politicians in Washington continue to live in their own world where they get their perks and pensions even if they are booted out of office. Anon, that is silly. The problem is in regarding retirement as an entitlement, rather than something that should be earned and saved for. We should abolish the idea of benefits predicated on age, and have only benefits predicated on disability. You work until you are disabled, whether that be by injury, disease, or old age, or until you have saved enough money to stop working. Plenty of people are perfectly capable of working until well in to their seventies and even eighties, *especially* with modern medical care, which we are paying for regardless. So if you get the new hip, keep working until you can afford to retire or are no longer able to work. We need to stop subsidizing the failure to save. Then we need a system of health care finance that does not distinguish in its tax effects between employment benefits and otherwise. Apparently "Anon" deleted his comment while I was responding. An anonymous with a sense of shame? Wow. An appropriate quotation, and one of my favorites. "A nation cannot plunder its own treasury without putting its Constitution and its survival in peril." - Justice Kennedy, Clinton v. City of New York, expressing regret at having to strike down the president's line item veto in 1996. Absolutly too much taxing and spending by the porkers in washington d.c.
Do you have any information about 2000 for example so we could see the growth in spending? Your post and some of the responses show the Dems are winning the PR battle. We may be screwed. However, the Democrats increased spending greatly since they took control of Congress and probably doubled the increase since Obama took office. Obama's budget moves some of these increases into the entitlement column, thus makinmg them untouchable. The Republicans can achieve meanginfull cuts by walking (drag) back spending to 2007 levels. How hard is it to expose the duplicity of the Administration and its allies in the Congress. Very hard, judging by the paltry effort trickling from the conservative machine. Politicians are not only failing to propose reductions, TH, they are crossing state lines to avoid even discussing reductions in a public forum. For this special class of miscreants, I would propse an addendum to your proposition: Given the urgency of the deficit, AWOL politicians should be subject to RECALL...immediately. My general thought on these charts is that they are pretty, but not completely informative as other types of charts. Specifically, those address revenue and spending overtime and particularly as ratios of GDP. We have a spending and revenue problem. Revenues as have gone from 17-18% of GDP to 14-15%. And spending has gone from 19-20% of GDP to 24-25%. Both problems need to be addressed. The revenue needs the most work, the entire US tax code is Kafka-esqe and should be seriously trimmed into something more manageable not heavily depended on the fluctuating incomes of the wealthy. Entitlements should be indexed to the both wealth and mortality rates. New rule: Anybody who lists Social Security as being a budgetary burden that is functionally equivalent to Medicare or defense spending is transportingly disingenuous, and ought to be bookmarked alongside other fantasy sites. This problem would be corrected almost immediately by market mechanisms if we had a currency backed by some fixed commodity or commodities. In a world governed by real money the U.S. Government would be subject to a real credit limit as its ability to procure the asset(s) underlying the currency is limited. It's no accident that our national debt has gone from essentially $380 billion to $14 trillion in the 40 years since Nixon closed the gold window. Remove real limits on credit growth and, shockingly, credit grows exponentially. TH, I agree, but you know your just saying we have to vote them all out?! All I learned is this isn't new. Percentage wise, defense seems to be the only spending that changes in any big way. 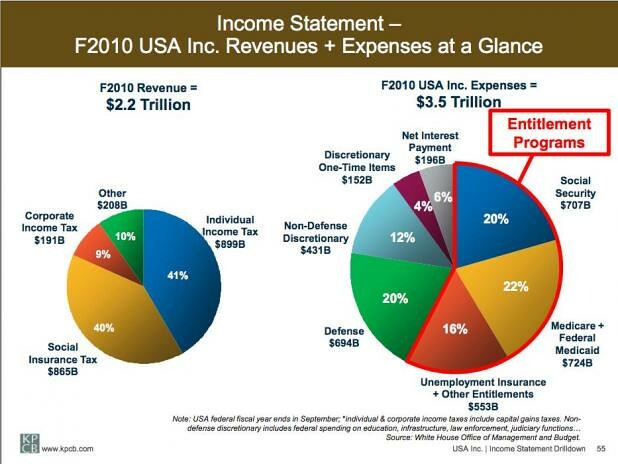 Entitlements have grown like a slowly expanding waistline. Unemployment has recently had a big jump (no surprise) Politicians spend money we don't have. That's constant. Who will stand up and say Social Security needs to be cut by 30%, Medicare by 30%, Defense by 30% and still have to increase revenue (i.e. taxes). Politicians promise to balance budgets by slashing some discretionary item, knowing that they can claim millions of spending cuts without having to take on the billions or trillions that need to be addressed. More worrying is that those politicians might actually think that cutting some goverment office, foreign aid, education, whatever actually will solve the problem. Imagine spending 60% more than you make? Look at the size of the spending compared to income! Wow! I do think people understand. And they wonder why people don't vote. Some form of mandatory private accounts will be needed. The libertarian in me despised anything 'mandatory', but I fear a mass of people, in their later years with no savings, will vote themselves a raise by raiding the savings of people like myself. I would look to what Chile did and the Federal Thrift Savings Plan (that replaced part of the Federal pension system) for ideas on how to get future generations out of the entitlement mess. None of this stops until the Fed and fractional reserve lending go away. As long as Fed monetary policy and private bank credit money creation enables politicians to overspend with little obvious impact, no budgetary Battle of the Bulge can ever be won. There isn't one American in 1,000 who gets how pernicious the Federal Reserve is to the moral and financial health of this country. You left out the United States government's primary source of income: inflation.